How the Nittany Lions are using the science of acoustics to help crank up home field crowd noise. Next season, the university's athletic department will put into play a new strategy to make its field even louder thanks to a team of acoustic scientists. The goal is to send a deafening wall of sound at the opposing team's offensive line. "We're not going to let visiting teams get comfortable, and if you can't get comfortable, you're probably not going to perform as well," said Guido D'Elia, director for communications and branding for Penn State football. Working with D'Elia in 2007-08, Penn State graduate student Andrew Barnard recorded crowd noise during three home games. Using 11 sound meters strategically placed around the field, he compared volume levels when each team had the ball. When the Penn State's Nittany Lions were on the offense the noise levels inside 107,282-seat Beaver Stadium reached 75 decibels on the field. That's about as loud as a car radio playing at a reasonable volume. But the noise skyrocketed to 110 decibels -- 50 times as loud -- when visiting teams were on offense, drowning out the calls of the quarterback and making last-minute adjustments at the line of scrimmage very difficult. "For the visiting quarterback that would be like trying to have a conversation while standing next to a giant speaker at a rock concert," said Barnard. The numbers support a 2007 ESPN survey in which coaches gave Penn State the highest marks of any stadium for noise -- higher than Louisiana State University's Tiger Stadium, where cheers after a 1988 touchdown were picked up by seismographs across campus set up to measure earthquakes. "Everyone wants to say that they have the loudest fans, everyone wants that badge of honor," said Barnard. "Any big stadium is going to claim that they're the loudest, but Penn State is only one with data to back that up." As an added advantage, the Nittany Lions play Barnard's recordings during practice to prepare for the noise they will face at other stadiums. They are confident that they will not hear anything worse on the road than what their own fans can produce. Penn State used acoustic science not just to earn bragging rights, but also to look for ways to increase the home field advantage. "We were curious about which sections were loudest and reach the field best," said D'Elia. Barnard presented his data during an Acoustical Society of America meeting in Baltimore. His measurements showed that, as expected, the student section -- which stretches from the middle of the southern end zone to the 30-yard line on one side -- made the most sound of any part of the stadium. "Our students have really found their voice in the past six or seven years," said D'Elia. "We used to be the quietest stadium over 100,000 [seats]." Barnard is confident that moving the students to different seats could make them sound even louder. When the stadium was empty, he searched for the best spots for an audible assault by carrying a noisy speaker around to 45 different seats and measuring how loud it sounded on the field. A computer model crunched this data to fill in the rest of the stadium. For seats on the sidelines, closer was better. Students sitting in the highest rows contributed very little to the overall sound. But the situation was reversed behind the end zone. Higher seats could be heard better than field-level seats because of a trick of the stadium's architecture, said Barnard. Stadiums with a steeper slope, like Oregon State University's Reser Stadium, are generally thought to hold sound in better than Penn State's stadium. But according to Barnard's data, Beaver Stadium's upper deck -- which juts out toward the field at the end zones -- may act like a megaphone that catches and amplifies the sound in the higher seats of the lower levels. 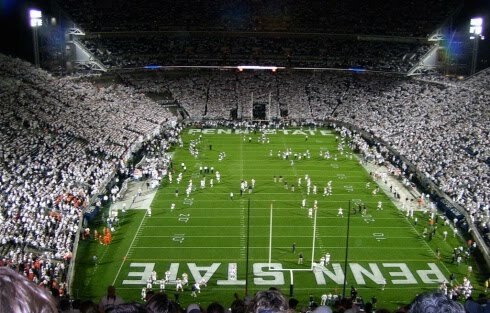 To take advantage of this acoustic effect, Penn State plans to move the 20,000 seats in its student section squarely into the southern end zone when the entire stadium is reseated for the 2011 season. Barnard's computer model predicts that this relocation will quiet the east side of field slightly but increase the sound on the west side by almost 50 percent -- cutting the range of a quarterback's voice by another six inches and potentially causing more fall starts and penalty opportunities. "We will own that end zone," said D'Elia. "The students' voices will have an unobstructed view of the entire field, and when another team is down in that end, we'll be able to maintain that home field advantage." Earth Day: Have You Been Saved? Look at this neat thing!